Heat kills – Curb Saves! All electronic components generate heat which will shorten the life of your gadgets – including your laptop. When keeping your laptop cool is the problem, the CURB, Think by ‘M’ comes to the rescue. Made of some sort of flexible silicone type of material CURB provides a firm base with a bit of a bite that tends to grip the laptop and keep laptop table sliding to a minimum. Being small and compact is a key feature because this is one useful product that can be slipped into a briefcase or backpack and transported virtually anywhere. On the other hand, being so compact and small CURB can be easily misplaced therefore it is wise to get CURB in one of the brighter colours so that CURB doesn’t get lost in the crowd as it roams around off leash among the many items on your busy desk. 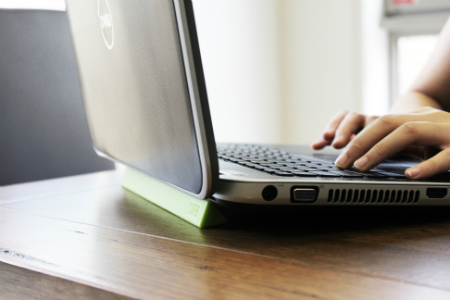 Using CURB under your laptop will raise the rear of the laptop to an angle that is just high enough to make typing on the the laptop keyboard a lot more comfortable than typing on the keyboard while the laptop is sitting flat on the table. This angling up results in much less strain on the wrist and is a comfort factor that will be immediately appreciated as well as providing significant long term health benefits in a techno -world where wrist strains have become a common complaint. CURB, a product designed by ‘M‘ is the Minimal Laptop Stand, available in a range of stylish colours, which provides a simple solution to an everyday problem at a reasonable price.